The schism was inevitable, but efforts to repair it seem doomed to failure. 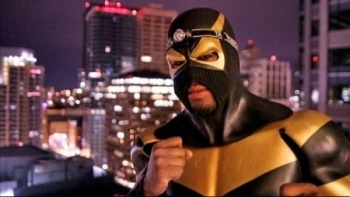 Seattle-based superhero, Phoenix Jones, may have grabbed a few headlines recently, but his hands-on methods are ruffling feathers among his contemporaries in the Real World Superhero organization. The RLSH think it's only a matter of time before Jones, or another member of his Rain City Superheroes, gets themselves badly hurt, or even killed. Members of the RLSH usually focus on charitable endeavors like handing out food at homeless shelters. Some, like New York City's Dark Guardian, take a slightly more active role, but ultimately remain non-violent. Jones, on the other hand, will often actively try to stop crime with his arsenal of non-lethal weaponry. His actions have most recently resulted in a broken nose, and Jones says that he has also been stabbed and shot in the past. Knight Owl, a member of the RLSH from Portland, OR, said that it was inevitable that there would eventually be someone who agreed with the movement's mission, but not the methods. Nevertheless, he felt that it didn't reflect well on the superhero community, and that Jones was something of a thorn in the RLSH's side. According to Jones, the tension between him and the RLSH isn't new. Jones said that the movement resented his quick rise to prominence, and blackballed him when he tried to smooth things over. There have been subsequent efforts to patch up the relationship, but they've met with little success. Jones was critical of the RLSH, saying that although its members did good work, there was no point in putting on a superhero costume if you weren't going to fight crime. He said he didn't see the use in giving food to homeless people, if you weren't also going to deal with the drug dealers who made their lives even harder. It really seems like Jones and the RLSH are both right. Giving food to homeless people is a good start, but hunger is just the most immediate of their problems. On the other hand, the RLSH isn't kidding when it says that's it only a matter of time before someone is seriously injured. With any luck, that time will be a long time coming, but it will happen.